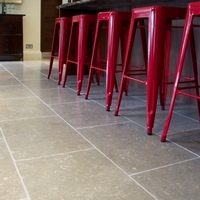 Ca'Pietra Tiles.Olivier Limestone Tumbled Floor tiles. Plenty of interesting markings and the colour tones of the outdoors mean this beautiful limestone works well with natural wood furniture. It has a tumbled finish which recreates the effect of sea-water on beach pebbles, and exposes the surface grain for a wonderfully tactile feel.